of human behaviour; helping you predict the workplace behaviour of candidates and employees. The Assessment has been used by thousands of businesses around the globe for over 60 years to tie their people strategy to their business strategy. and manage, sort, filter and favourite candidates in the recruitment process. Identify the behavioural pattern of the ideal candidate. Compare candidates behavioural pattern to the Job Pattern™ and ensure a perfect match every time. Get to know your employees on a whole new level. Learn how to play into their strengths and empower them to reach their full potential. The Predictive Index™ helps you develop great leaders by defining behaviours of successful leaders and identifying areas of improvement in your existing leaders. Handle periods of transition effectively by anticipating sources of conflict. Provide managers with the tools to effectively manage and prevent conflict. 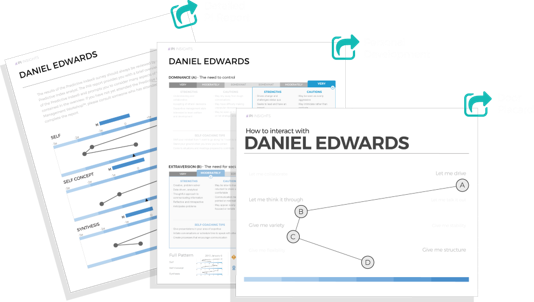 The Predictive Index Behavioural Assessment™, available from Certified Partner, Predictive Success, is a scientifically validated behavioural assessment that was developed in 1955 by Arnold Daniels. The behavioural assessment measures 4 core behavioural drives and 2 resultant factors. Where these core drives fall on a simple scale creates a behavioural pattern that provides a framework for understanding the workplace behaviours of your people. WHY THE PI BEHAVIOURAL ASSESSMENT™? The scientifically validated behavioural assessment guides data-driven decisions in four practice areas: talent acquisition, talent development, change management and productivity improvement. With nearly 2 million assessments completed annually, The Predictive Index Behavioural Assessment™ gives you a practical and reliable understanding of the unique needs and behaviours that drive employee engagement. It is EEOC compliant and available in 65 languages. Our team of consultants are among the top in the global community of the Predictive Index™. We are members of the HRPA, SHRM and three time award winners of the Profit 500. We are jazzed to also be asked to teach as guest lecturers at Queen’s University, Ryerson, UBC, Trent and Sheridan College in workplace analytics for talent acquisition, succession and people development. Scientifically validated by over 400 validation studies. Effective across jobs, organizational levels and industry. Easy to administer and only takes 6 minutes to complete. Consistently related to workplace outcomes such as sales, customer satisfaction and turnover.